Hiking In Heels: Could you live below the line? In my line of work, if something is below the line it means it is digital. As you may have guessed I work in Advertising. The campaign that I am talking about though, is a brilliant one and one that will hopefully help if not end, but make people realise what it is like to live in poverty. As a child I never thought of my family as poor, I was happy and we never really needed for anything - however, we definitely weren't rich. I had my mum, brother and sister and we all spent time together during the school holidays, either at the park or in the garden with a paddling pool - mostly anything that was free. However, children in other countries don't even have this kind of water to drink - let alone fill a pool and play in all day during the mildly hot weather we have in England, compared to the scorching hot weather people have in countries where sanitary water isn't even available. As westerners we take things for granted and expect that it is our right to a lot of things. However, it isn't just our right to have the basics like clean water and clothes on our backs - it is the whole worlds right. Explaining things that I have seen in other countries to my family is hard, but this photo is a prime example of how my family thinks compared to the reality of what is happening around the world that we live in. 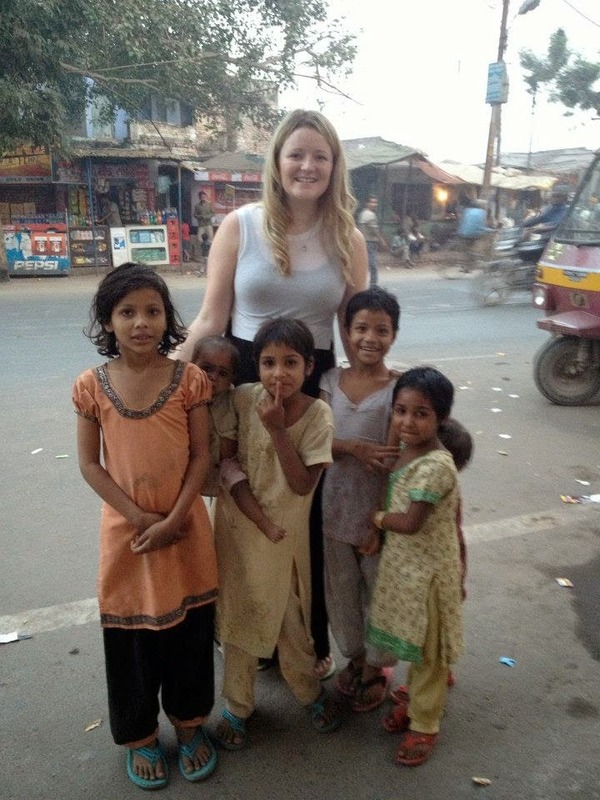 Here is a photo of my time in India in 2012. After uploading this photo to Facebook, my mum commented "Ahh look at those poor little girls in rags...". Well I can honestly say that these little girls were pretty rich by Indian standards. They may not live in a palace, but their parents can afford to send them all to school. This is in a place, where I was able to buy a pearl ring for £2 and a set of pearl earrings for £1. This is enough to feed a family for around 2 or 3 weeks. On one of my first trips to a poverty stricken country, I found myself crying a lot at what I saw there. The one conversation that I remember having there though, was with a ten year old boy. I was staying in his home with his mum and we were sharing his room with him. One day he asked me to help him with his English homework. So I did and we were having a conversation afterwards about school and he told me, when he grows up he wants to be a doctor, so he can visit England and live in my house like I have in his now. This way he will be able to make his dad better too. After further conversation he told me that his mum lets people stay so that she can afford to send him to school, this is because in his words, his dad is in a 'mad hospital'. This, I could only presume, meant that his dad had some form of mental health problems. We were talking for a while and when we got up to leave I noticed that he was limping and had no shoes on. So I asked him to show me. When I looked, I saw a huge and rather worryingly deep cut on the bottom of his foot from some coral he had stood on. The kind of cut your mum would have hysterically rushed you to the hospital over. As the hospital was a few hours away by boat, I knew that I would never be able to get him there or ask his mum to take him. So I did the only thing I could think of at the time and pulled out my first aid kit. I used the steri strips to try and pull the wound back together, then bandaged and pulled a verruca sock over it - to hopefully avoid any infection. I then handed this kit over to his mum, so she was able to change the dressings. For these reasons, I have thought of my life in England as a pretty shallow one and have wondered how I might be able to use it to do some good (I've even thought about joining the Army to train as a nurse). But I am yet to come up with an answer to that question, which is a little more logical/practical, but I hope I find one soon. For now, I am going to take the challenge to Live Below the Line - but not for just 5 days. I hope I am able to go a bit longer and a bit further with this challenge than the initial one set. The cause is such a good one, how could I not take up the challenge? My aim is to raise £200, but if I can raise more then I will be more than happy. For now, I am going to need a lot of will power and support though. So come on guys get those donations rolling and CLICK HERE NOW TO DONATE. That's really sad to read about the boy you stayed with :( I can imagine if the parents were going to have any health problems, mental health ones wouldn't be the least understood and accepted by communities in less developed places. Good thing you were able to help the boy with your first aid kit! When it's not a big charity event going on, it can be easy (for me at least) to forget that people don't live as comfortably as I do, which I definitely take for granted. It's great that you're doing your bit. Good luck with the challenge!